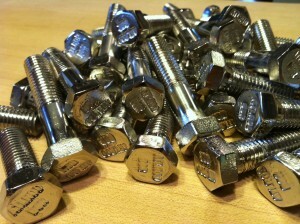 Atlanta Rod manufactures hot forged domestic headed bolts. We forge headed bolts from 3/8″ to 2-1/2″ diameters in the grades listed below. We can produce headed bolts in most lengths and in many head configurations. We maintain a great steel inventory in carbon, alloys, non ferrous, and specialty materials to insure that short lead times do not present a problem. We offer domestic certifications and additional testing can be performed on request.